“When in the Course of human events it becomes necessary for one people to dissolve the political bands which have connected them with another and to assume among the powers of the earth…” and so it began two hundred and forty-two years ago today as the greatest nation the world has ever known was born. Unanimously approved on July 2nd, 1776, and signed on July 4th by all 56 delegates to the Continental Congress, the colonies now regarded themselves as thirteen newly independent sovereign states…independent states yet united together…and thus a new nation was founded…a Judeo-Christian nation…forever to be known as the United States of America. Preceded in governance by the Continental Congress…a convention of delegates from each of the thirteen colonies…the Congress met from 1774 to 1789 in three increments, with the first being a call for a convention concerning issues raised about the blockade and the “Intolerable Acts” penalizing Massachusetts. By 1774, Benjamin Franklin was able to convince the colonies to form a representative body, which at first was divided on independence and a break from the Crown. However, in time the new Congress gave their unanimous vote for independence, established a Continental Army, giving command to George Washington. And while the Continental Congress was waging war with Britain, making a military treaty with France, and funding the war effort with loans and paper money, Richard Henry Lee of Virginia first proposed the idea of succession at the Second Continental Congress. Reading an important resolution that in no uncertain words stated, “Resolved: That these United Colonies are, and of right ought to be, free and independent States, that they are absolved from all allegiance to the British Crown, and that all political connection between them and the State of Great Britain is, and ought to be, totally dissolved.”…the march towards independence began. Soon after, in August 1775, King George III declared American colonists were “engaged in open and avowed rebellion” as the colonies began pulling back from British rule by taking control of their ports and establishing formal guidelines for creating local governments. A ‘Committee of Five’…Thomas Jefferson (who actually drafted the declaration), Benjamin Franklin, John Adams, Roger Sherman and Robert Livingston…was then appointed by the Continental Congress to write the declaration. 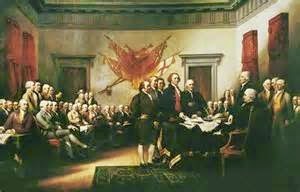 Formed on June 5th, 1776, the Committee returned to Congress with the completed declaration on July 4th. The committee was disbanded when the declaration was made public on July 5th. This one document alone changed the course of modern history for its ramifications were heard by all “free men of conscious”…men who now truly understood that when their leaders…when their government…becomes both “tyrannical and abusive”…when their leaders dare violate time and again the rights of the people then the people have the right…actually they have the duty…to revolt and put safeguards into place to protect those rights. And what was this new nation but an experiment in self-government…an experiment in liberty and in the sovereignty of the people…of people who believed that human equality and liberty should be the rule of law not only for those forever to be known as Americans, but for people everywhere “and that they (must) derive their just powers from the consent of the governed,” meaning ‘We the People’ through the power of the ballot box. And with the Constitution defining those beliefs, never forget that our independence and our beliefs were secured for all time by those brave men and women whose blood was spilled all those many years ago. So as we celebrate the day our great nation was born from the pains of protest against a “tyrannical and abusive” king…a nation unseen in the annals of man…a nation exceptional in concept for its being built upon freedom, justice, and equality for all… know that now the time has come where we must stop those perpetrating the conflicts of conscious by those who are trying to divide our great nation…conflicts courtesy of those enemies within coupled with apathy from the masses. And if our beloved America falls…if our Constitution falls…tyranny and turmoil will become the order of the day not just for our homeland but for the world as well. But thankfully ‘ifs’ tend to be supposition alone for history has shown that America will survive because America must survive…and no other option must ever be allowed to exist. And while some try to say that what we thought of as our brightest hours were really not as bright as we thought or that our darkest moments were not as dark as we remember them…the pages of history alone will show the truth, but only with the passage of time. And while our nation continues to move forward by hopefully learning from the lessons of the past, the fact remains that certain folks in every generation…especially the youngest and the most idealistic…continue to think of themselves as being under attack from those whose political ideologies are different than their own. And while of late it seems that we as a nation are always facing or coping with some sort of crisis or another…whether those crises be manufactured from inside our own ranks or from those looking in from the outside…surviving remains the only option afforded to even those of us patriots who sometimes forget the freedoms our country allows us. And so America survives and will thankfully continue on simply because ‘We the People’ demand it be so…and that demand at times might even mean that more blood must be spilled in the name of freedom…blood spilled like it was when America was born…blood spilled when brave patriots fought back against those trying to bring them to their knees. So my fellow patriots enjoy this day…fly our flag proudly and enjoy America’s birthday as freedom rings out from “sea to shining sea”…but never forget our nation’s birthing pains for those freedoms we all sometimes take for granted came at a very high price. But know that no matter the obstacles placed in our way America remains a true bastion of freedom…the shining light that draws those whose hope springs eternal and where dreams become the realities of those longing to be free. Happy 242nd Birthday America…May God Bless and protect you today, tomorrow, and always. Copyright @ 2018 Diane Sori / The Patriot Factor / All Rights Reserved. Today, Tuesday, July 3rd from 7 to 9pm EST on American Political Radio, RIGHT SIDE PATRIOTS Craig Andresen and Diane Sori present their Independence Day Special replete with articles and July 4th fun facts. I’m an American Patriot who refuses to let our beloved country be changed into something unrecognizable by a man who wants to radically alter and destroy our America and take away our children’s future. We patriots ARE the grassroots movement and we bloggers must spread the truth about the corrupt and traitorous Obama regime and his sanctioned islamization of America before it’s too late. Many believe Common Core is nothing more than a power grab by the Federal Government to wrestle away educational agendas from local school boards and put an end to home schooling and private education–you know, mass indoctrination.